Drake's Watching 'Mubarakan' Thrice To Honour Athiya Shetty's BDay! Can you remember the time when we were all pleasantly surprised that Nick Jonas and Priyanka Chopra were ‘friends’? And look at them now! Well, another such international friendship that had everyone surprised was Athiya Shetty and Drake’s! The Kiki singer had bumped into Athiya when she was holidaying in London in September last year, and he was quite taken with her. He not only wished her on her birthday on Instagram last year, but even commented on her post for dad Suniel Shetty’s birthday in August! 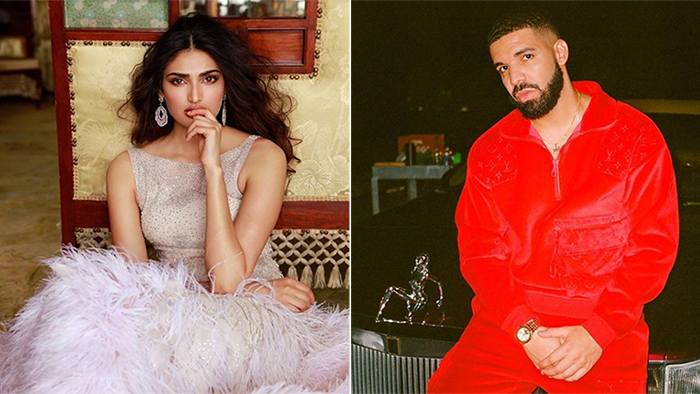 Today, as Athiya Shetty celebrates turning 26, people who know of her and Drake’s camaraderie were keeping an eye out for @champagnepapi to drop a birthday wish this year too! And what do ya know, Drake did! A rather adorable one as usual, referring to Athiya as ‘My Shetty’! Yeaaaaaaah… about that last bit of the comment…. A lot of people who aren’t aware of how Drake knows Athiya and the Shettys were left stumped as usual to see him wish her with so much love and warmth. But what bothered a majority of the people in the comments is Drake’s questionable decision to watch the film Mubarakan not once, but THRICE! Not to sound to harsh but it is a known box office fact that not even a lot of Indians watched the movie once, let alone twice. Which might’ve been why people were a little worried for the singer! But hey, there’s no determining the things we’d do for the love of our friends. And this only goes to show how much Drake loves ‘his Shetty’! Besides, who knows, it might be some kind of an inside joke between the two? Either way, the birthday girl was super happy that her friend dropped by in her comments to wish her and thanked him for it! And everyone already imagining Drake singing “Shetty, do you love me?”, take a chill pill! These guys are friends!